I really like this book. My husband and I are pursuing the debt free life style and trying to get out of our student loan debt, so I found this book to be super encouraging. 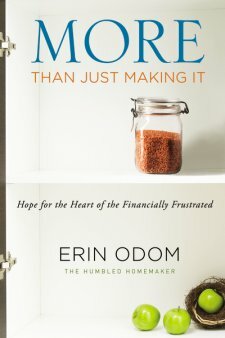 I thought this book was helpful for those who are financially frustrated or for those who aren't, but are looking for tips to handled their finances better. Erin talks about how she and her husband were not able to live on his income as a teacher and how they had to rise up to trust God beyond their circumstances. It is a wonderful book and I highly recommend it! It isn't just a book about debt, but a book about re-inventing how you live and how your spend or how you envision your lifestyle and what matters most. This book is a great book for those who are trying to get out of debt and I found it super helpful. I give this book 5/5 stars. A favorable review was not required and all opinions are my own.